I was driving by the old Ski Market on Route 9 as lots of people do everyday and haven’t looked up permits but I’ll go out on a limb and guess there will be a Dunkin’ Donuts moving in. I think it would be an odd place considering Panache Coffee is also in that same plaza, but I guess DD knows no competition with their loyal following. I’d be more excited if their coffee was consistent from store to store but it’s not what it used to be. Or who knows, maybe the driver of that truck just happened to stop for a cup of coffee at Panche? I believe that Summit Sport Ski Shop across from the Route 9 Fire Station may be moving there. I saw that. I was wondering about it, since there’s also a sign in the window saying that Summit Ski Shop is moving there, too. 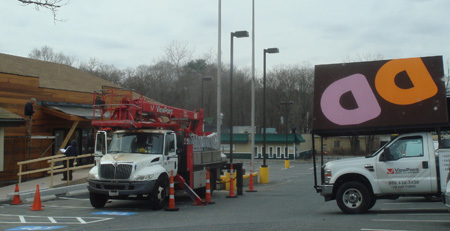 Just what Framingham needs… another Dunkin Donuts. If Dunkins is going in I hope Panache isn’t put out of business. They are such nice people and the shop has such a relaxing atmosphere. How come nothing interesting ever goes into our local shopping plazas? Nobody local has enough imagination and money to start up something unique? I believe that type of signage for a DD is for a “concept” store. Which would be kind of cool. That would be a most odd location for a DD as it sits halfway between two others, on each side of route 9. Then again, I work in Boston where there is one on just about every other corner. I agree w/Nicole. There’s not a lot of vision around here when it comes to innovative, or interesting shops. I’d love to see someone take a page out of Susan Sarandon’s book and open up a ping-pong bar around here. It is Summit Ski and Snowboarding that is coming there…passed the construction today and saw a sign in the window. Maybe DD isn’t moving there, but there are altogether too many of them already. Visiting California this summer I was struck by how many local, independent donut shops there were, with really great donuts made on site, unlike Dunkin whose locations get their donuts from a central plant. I didn’t grow up here. Did there used to be independent donut shops that were strangled by DD, or was it always this way? Glad to see Summit Ski thriving and perhaps wanting to grab better real estate or a bigger place. I hope something decent goes into replacing their old space — that’s such a nice building. To those who lament too many DD’s in town, I’m of the same mindset. The problem is, a spot on Rte. 9 is such a cash cow for fast food, who wouldn’t want to set up shop there? I’d love more interesting and independently owned places around town, but only places like Wellesley have quick and close access to all that wealth that allows those little shops to survive (and, perhaps, bylaws that keep out the mundane). Alas, This is Framingham…. there used to be other donut jobs before DD’s but they got so big they just ate them up. We used to have Mr Donut around here. Atleast honey dew is still around. Wish they could operate a rt 9 shop. Mr Donut. that was around me in Medford as a kid.